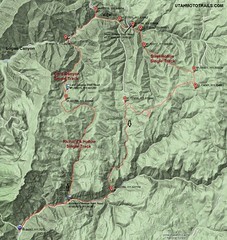 The Richard's Hollow Dirt Bike Trail is located in Hyrum Canyon, South of Logan Utah. This loop consists of 3 separate Single Track trails linked together to make a loop. Any of these trails could be done individually or some pairing can be done to do an out and back such as Richard's Hollow to Card Canyon and back. The loop we did required a short ride on the main Logan Canyon paved road. We started by riding up Richard's Hollow. This trail has had some difficult sections at times, but recent maintenance has reduced the difficulty level. There are still some tricky rock sections along with some narrow exposed sections that bump up the difficulty. This trail is very scenic with the shade of the trees and rocky canyon much of the way and is is probably the best part of the loop. Once this trail ends, you meet a dirt road where you need to turn right and ride a short distance to the Card Canyon spur on the left. Card Canyon is also Single Track and is tight and technical with a few tight switchbacks. This trail drops to another dirt road that leads out to Logan Canyon. From here we turned right up the main canyon(paved) road until we got to the turn off to Steel Hollow which is another paved road, although much smaller. After passing some camp sites, stay left at the fork. This road will end at a turn around loop where the Steel Hollow Single Track Trail will start. Steel Hollow is easier with only a couple intermediate sections. This trail will lead up to some dirt roads at which point we followed the roads back to the truck near Richard's Hollow Trail Head. 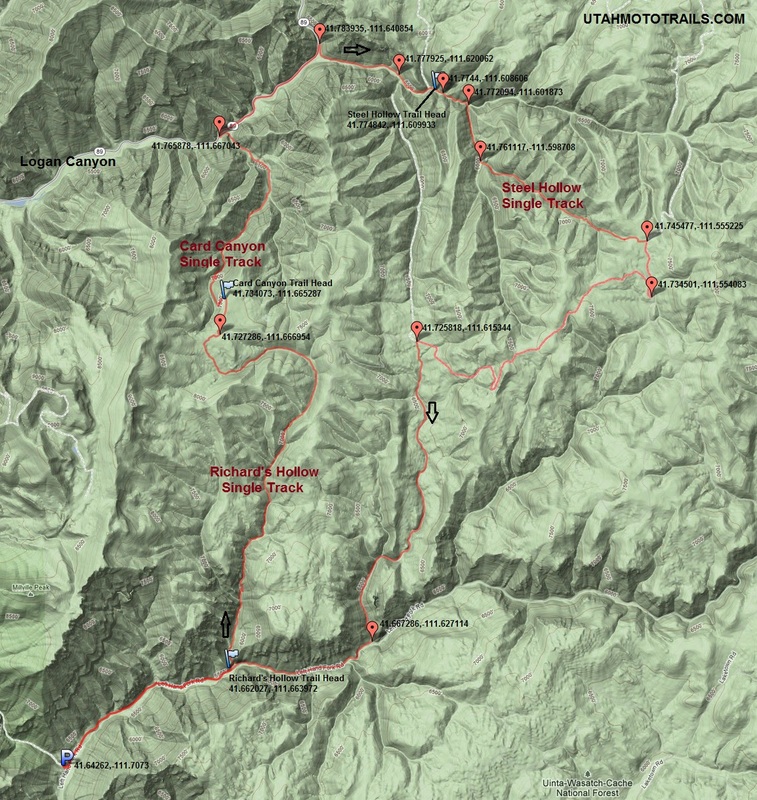 Type: Single Track mixed with jeep roads, short section of paved. click for Directions to the Richard's Hollow Trail Head from your location, see the map below for route information. There are many parking options along the road before reaching the Richard's Hollow Trail Head as well as a small pullout at the trail head. Be aware of other traffic along this road as well at MTB and Horse traffic on the trail. This route is one of many in the area, but it combines a few good single track trails into a decent ride. We traveled the mapped route in a clockwise direction. This is a great ride. I road it a couple weekends ago. I'd highly recommend it. Just watched your video, makes me want to get back up there right now!